Home / Store Template / How to Edit Header? Inside your webShaper store, header template is located at the top of webpage. Example below is header from Lalala template design. You can edit your website header to only include tabs that you want your customers to see, such as hide header, change header location and add new header. So, how can you do that? 4. Search for header.html and click Edit. 5. 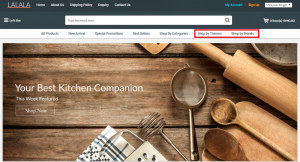 In this example, you want to hide ‘”Shop by Themes” header. So, you can search by pressing (Ctrl +F) button and enter ‘Shop by Themes’. 6. Add <!– and –> between the line. 8. 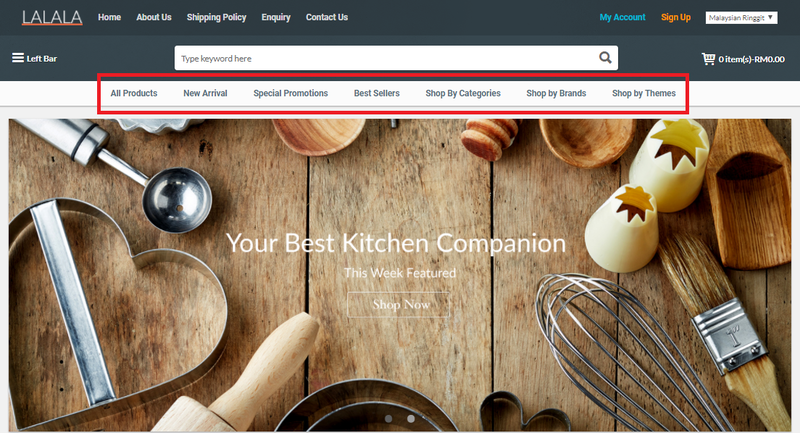 Refresh your website and you will see that Shop by Themes header is hide from your webShaper store. 5. In this example, you want to change header location of “Shop by Themes” with “Shop by Brands”. So, you can search by pressing (Ctrl +F) button and enter ‘Shop by Themes’. 6. Highlight row of “Shop by Themes”, right-click and then cut it. 7. Then paste it to the next row of “Shop by Brands”. 9. Refresh your website and you will see that Shop by Themes header location is changed with Shop by Brands header. 5. In this example, you want to add new header by the title of “Sales”. So, you can search by pressing (Ctrl +F) button to find other header such as Shop by Themes and enter ‘Shop by Themes’. 6. To add new header, just copy & paste the existing menu .html ushc as Shop by Themes. 7. Change “Shop by Themes” title name to “Sales”. 9. Go to Design > Static Pages. 11. Inside Create Static Page, insert your Link, Title, Description, Keyword and Content. Do not forget to tick Header, Footer and Leftbar. 12. Click Save and OK.
13. On Static Pages, find and copy “Sales” link. 14. Go to Template Files. 15. Search for header.html and click Edit. 16. Find “Sales” and replace the link there. 18. Refresh your website and you will see that new header is added and click on it to see the content.